Size: Plate is 15 inches across! 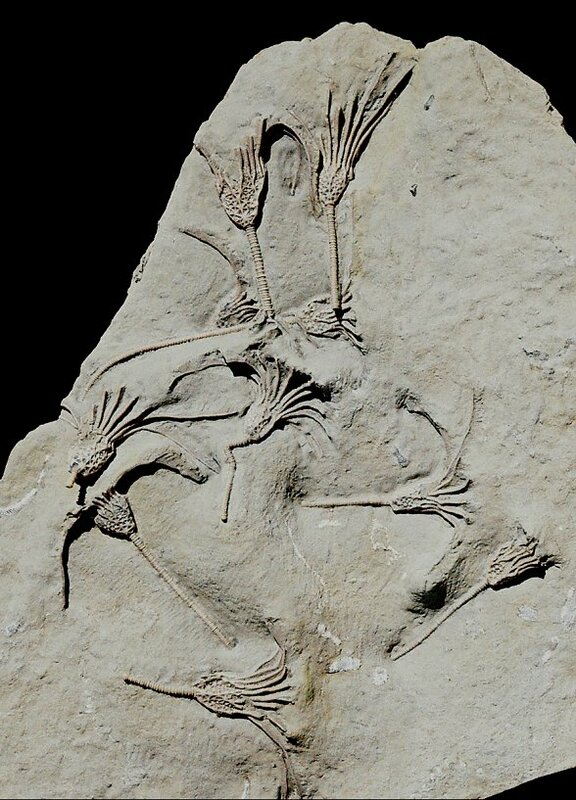 This is a spectacular display plate of Ordovician crinoids. There are TEN Glyptocrinus decadactylus crinoids preserved on this amazing slab. This type of camerate crinoid has a cup composed of numerous stellate plates and long, thin arms. The 3-dimensional crinoids on this plate are nicely articulated and have excellent detail - even the unique plate structure is beautifully defined. The delicate, splayed arms showcase the tiny pinnules in ''feathery'' fashion. ALL of the sea lilies still have long sections of their stems tightly attached, which is extremely unusual. The cream-colored crinoids contrast strikingly with the greenish-tan matrix. The echinoderms are all beautifully showcased on the large plate of shale - fully natural, no compositing!. This is easily one of the best multiple Glyptocrinus display plate we have ever seen.